In the now-gutted Classic Sci-Fi and Fantasy Films That You Can Watch on YouTube post on the front page of io9, I innocently asked for some thoughts on which of the existing Judge Dredd movies is considered the better of the two with the expectation that a lot of the audience would likely be familiar with the comic. The responses were numerous and passionate. I decided that night to help answer my own question and watched Dredd (2012) on Netflix. I will preface my opinion with the important factor that I have in fact not read any of the comics, so I didn't have that kind of stake in the outcome of the film. So how was it? Not bad. Very anti-climactic I suppose, but it was definitely watchable for me and I didn't feel the need to hit the FF button on the remote, which is always a bad sign when I need to self-edit a movie that way. I liked the special effects, particularly the slow-mo drug scenes that seemed like how the action sequences would be framed within the original comic's printed pages. Paramedic TJ: You know how often we get a judge up in Peach Trees? 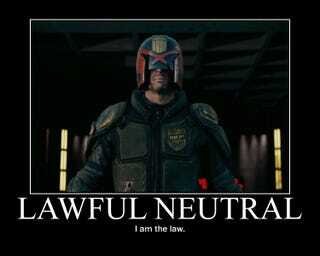 Judge Dredd: Well you got one now. Overall, the movie was well-done for what it is, but nothing ground breaking or particularly memorable in it for me. I can't see myself wanting to see this a second time in the future, but I would recommend that others give it a shot if they like action movies. I also have to admit that I'm curious to see what the earlier Stallone version is like... if I have the patience to sit through it.